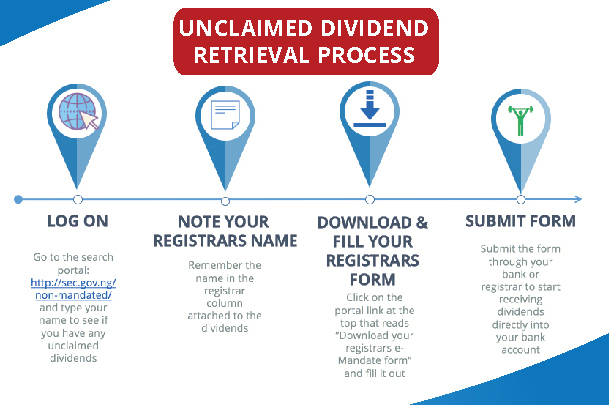 Note: all investors whose name(s) appear, are advised to URGENTLY download and fill their respective Registrar's e-mandate form and submit same at the nearest branch of their Bank or Registrar to register for the collection of their unclaimed dividends and subsequent dividends electronically; as well as for the proceeds from their secondary market transactions, to be credited to their preferred Bank Account (Direct Cash Settlement). The Commission also wishes to remind the investing public on the deadline of 28th February 2018 which will mark the end of issuance of physical dividend warrant, with a view to mitigating the risks associated with physical dividend warrants and improving investors experience. Furthermore, the 28th February 2018 deadline will see the end of free registration of e-dividend, being bank-rolled by the Commission since the inception of the exercise in November, 2015. Hence, members of the investing public are encouraged to urgently key into the on-going free registration. REMINDER: All investors in the Nigerian Capital Market are please advised to take advantage of the on-going free registration and register by approaching the nearest branch of their Bank or Registrars for enrolment before the deadline.